Veterinarians work hands-on with all types of animals every day. Some treat cats and dogs, while others care for exotic animals like camels and tigers, perform surgery on goldfish, or assist in programs to rebuild the populations of endangered species. June is National Zoo and Aquarium Month, a time to honor the people and institutions that play a crucial role in conserving, researching and keeping healthy exotic and endangered animals. Each year, over 181 million individuals visit zoos and aquariums—more guests than the combined attendance for the NFL, NBA, NHL and major league baseball. Veterinarians working with zoos and aquariums interact with animals that many people have heard of but not seen. One example is the red panda, of which there are less than 10,000 in the wild because of the loss of nesting trees and bamboo due to forest clearing. Thomas Colville, DVM, attending veterinarian at Red River Zoo in Fargo, N.D., works with red pandas daily as part of an Association of Zoos and Aquariums Species Survival Plan (SSP). In 2011 he helped care for a rare set of triplet red panda cubs weighing less than 100 grams each. “The cubs were weighed every day, and we noticed one lagging behind,” Dr. Colville said. He and the zoo’s veterinary technician did tube feedings, a delicate procedure on such a small cub. The duo worked flawlessly together, and over the next two weeks they also tube-fed the other two cubs. The triplets began to thrive and were later sent to other zoos as recommended by the Red Panda SSP. Caring for exotic animals poses special challenges, Colville said. For zoos, SSPs are integral to the conservation and continuation of endangered species. The Red River Zoo’s Red Panda SSP has been so successful that nearly 25 percent of the red pandas housed at U.S. zoos were born in Fargo. More than 450 SSPs are overseen by the Association of Zoos and Aquariums, whose breeding programs are designed to enable species to survive in captivity for the next 100 years. Participating zoos receive animal transfer requests, but Colville said some institutions may not always have an individual available. This year, Red River Zoo will send its male Pallas’ cat to the Calgary Zoo in Canada. At the same time, the Cincinnati Zoo and one in Japan will ship male Pallas’ cats to Fargo to become the new breeding males for Red River Zoo, and a female Pallas’ cat is expected to be identified and sent to North Dakota later this year. The goal of the transfers is to prevent the species from becoming too inbred. Sea Life Minnesota Aquarium, located at the Mall of America in Bloomington, Minn., is dedicated to public education and the rescue and protection of aquatic animals. Amy Kizer, DVM, owner of Lexington Pet Clinic in Eagan, Minn., is the attending veterinarian at Sea Life. One example is Lola, a bow-mouth guitarfish. Kizer and her team had Lola in the examination pool and were trying to find a way to draw blood without stressing her out. Typically, samples are taken from the bottom of the tail, which requires the animal to be on its back. Although bowmouth guitarfish aren’t normally aggressive, they are quite large—7 to 8 feet long—so to position Lola was going to be difficult. A team member was holding a flashlight, which accidently illuminated Lola’s tailfin. Kizer noticed a blood vessel directly on top, removing the need to turn over Lola. Sea Life Minnesota shared the information with Sea Life in Australia, which immediately began to use the technique on animals that are hard to restrain. 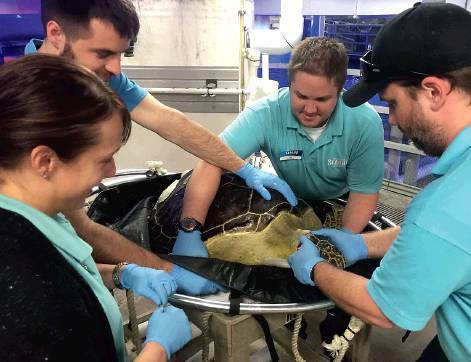 In addition to caring for exotic aquatic species, Kizer and the rest of the Sea Life team are dedicated to educating the public about marine life. One topic of conversation is SeeMore, a green sea turtle rescued off the Florida Keys after she was struck by a boat propeller. She has a noticeable scar on her carapace, which led to air being trapped under her shell. She developed a buoyancy problem and would have become easy prey if left in the wild. To fix the buoyancy issue, Kizer and her team glued weights to the shell to make swimming to the bottom and back to the surface easier. SeeMore’s story is used for create awareness of boating hazards to animals. “At Sea Life, we have a unique opportunity to expose landlocked Midwesterners to animals that live in the ocean and why we should care for them,” Kizer said. “For a visitor to come in and see an animal like SeeMore and see how a boat injury can drastically change an animal’s life, it makes everyone more aware. SeeMore the green sea turtle was rescued off Florida following a boat collision and was sent to Sea Life Minnesota Aquarium. The Wildcat Sanctuary, located in Sandstone, Minn., is a nonprofit, no-kill, accredited refuge dedicated to the rescue of unwanted or abused captive wildcats, including wild-domestic, crossbreeds and large cats. Not open to the public, the sanctuary’s mission is simple: Put itself out of business. Tammy Thies, founder and executive director, and her team rescue exotic cats kept as pets in substandard conditions. They also work with zoos to take in elderly cats in need of a retirement home as well as with zoos that are ending controversial breeding programs, such as those involving white tigers. “The AZA does not condone exhibiting or breeding of white tigers because of the inbreeding that occurs,” Thies said. “The white gene is a recessive trait that can cause many health defects. When a smaller zoo wanted to upgrade their standards to meet AZA accreditation, they signed a contract with The Wildcat Sanctuary stating they would no longer breed white tigers. The sanctuary also has placed animals in zoos, encouraging adoption rather than purchases from breeders. 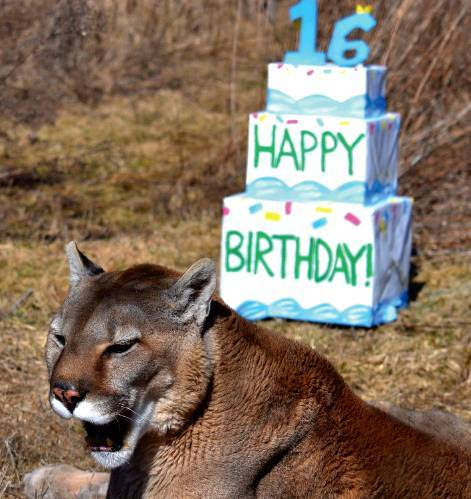 In one case, Thies worked with Lake Superior Zoo in Duluth, Minn., to rehome a cougar named Max. A couple was going through a divorce, and Max was in the middle of it. At the time, The Wildcat Sanctuary was at maximum capacity, so Lake Superior Zoo stepped in to provide a new home. Geriatric and suffering from arthritis, Max served to educate zoo visitors about why they shouldn’t own wild animals as pets. Because the sanctuary helped find him a new home, Thies and her staff were committed to Max for life. When the zoo was downsized this year, Max was relocated to the sanctuary since space became available. “Max received great veterinary care while at the zoo, and we received over 30 pages in transcripts and medical records from their team, which is not something we usually get when animals are seized and rescued from private owners, breeders and pseudo roadside zoos,” Thies said. Typically, when an animal is brought to The Wildcat Sanctuary, the medical team first performs an intake exam. The animal is sedated, spayed or neutered, and then administered blood draws, parasite and disease checks, full-body X-rays, vaccinations and microchips. Then the animal is quarantined for 30 days. Afterward, with a veterinarian’s approval, the cat is moved to a free-roaming habitat. Each resident gets room to roam, platforms to climb on, pools to swim in and temperature-controlled buildings to escape extreme temperatures. Outreach and education is a huge component of The Wildcat Sanctuary’s mission, and the message spreads quickly among almost 3 million Facebook followers. This post originally published on Veterinary Practice News on June 17, 2016.